Wow, April flew by so very fast! It was a month full of INSPIRATION around here. I love this FUN photo of Mama! She has a habit of closing her eyes just as I snap a photo, so I almost always have to take more than one. This day I was also joking with her about still sleeping since she was up earlier than normal (waiting for my nephew & his family to arrive). 2. 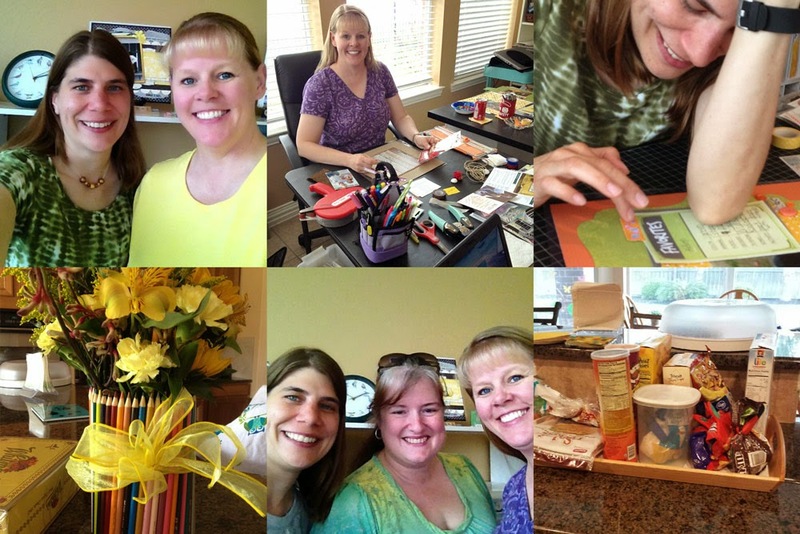 Hope & A Future Class - I had a great time teaching my mixed media Scripture canvas class at Scrappin' Goodtime. 4. Crop With LeAnne - My trip to Houston to visit and scrap with my friend LeAnne was so much FUN! Our friend Heather joined us for a day, too. There was lots of scrapping, laughing, eating, and visiting! Thanks, LeAnne, for a great visit! 6. READING FOR INSPIRATION - I am enjoying Part II of the Laura Ingalls Wilder course at Canvas.net. 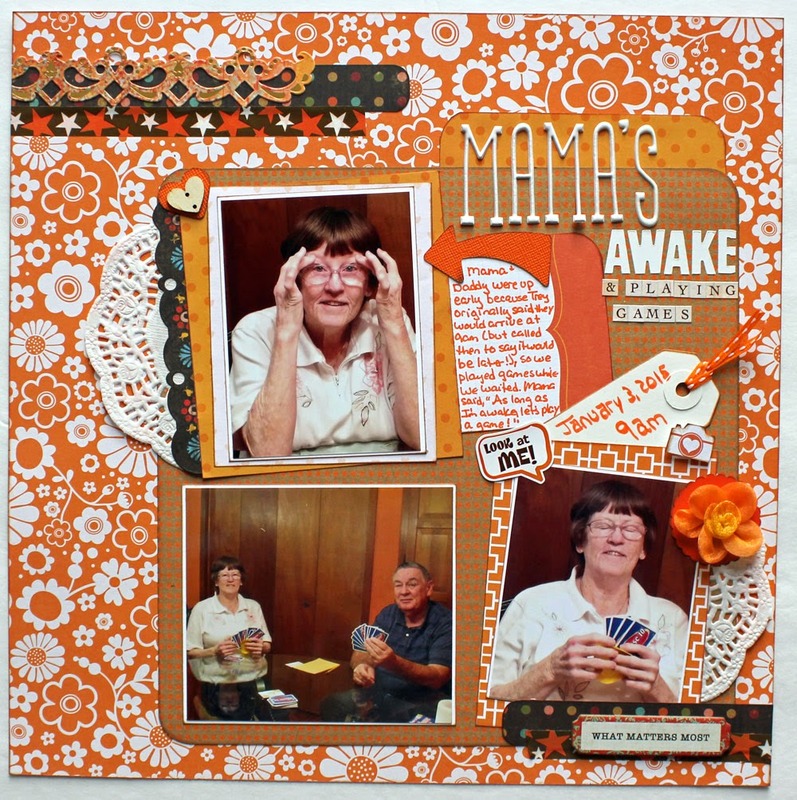 I found lots of other creative INSPIRATION in April and completed 19 layouts, 9 cards, 1 Photo Album Scrapbook, and a gift tag . 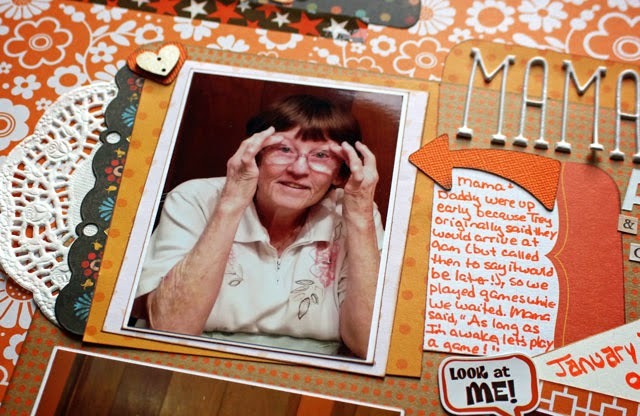 . . along with 50+ simple layouts for the scrapbook-for-hire retirement album I'm working on. I also published 11 blog posts and listened to 30+ podcasts. 1. (March &) April Top Five - I'm challenging myself to scrap my top five (photos or stories or events) from the previous month. Along with my March Top Five (that I didn't complete in April), I'll be scrapping these stories from April: (1) Easter , (2) those little green arrows, (3) putting in the crop, (4) annual get-together with Cheri, and (5) Michelle's clowning-around birthday. 2. 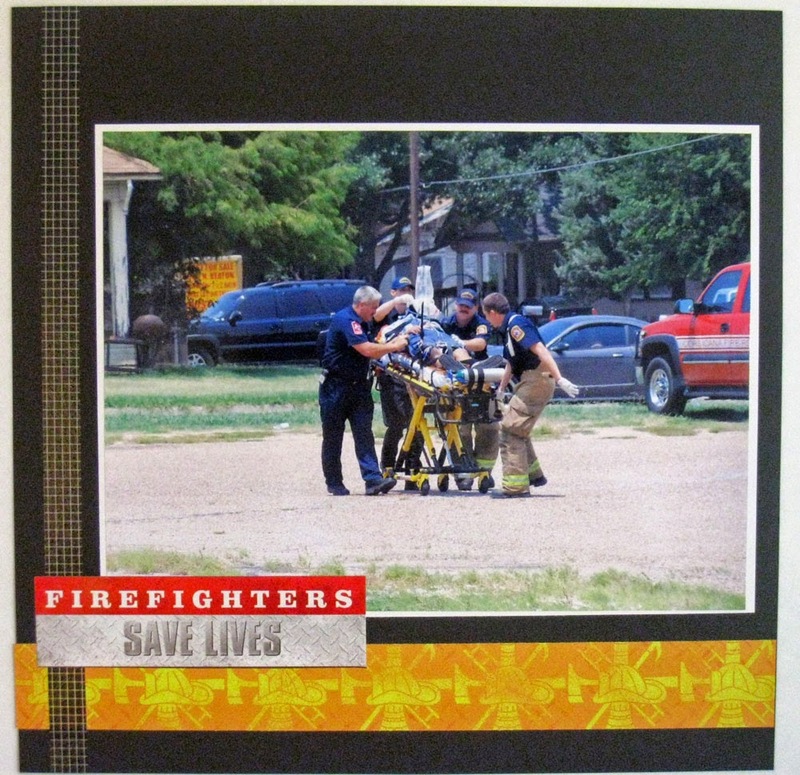 Scrapbook-For-Hire Albums - I am excited to be working on a firefighter's retirement scrapbook. Actually, it will be two volumes because it covers a 24-year career. I met the firefighter's wife when I stopped by Scrappin' Goodtime on my way home from Houston. She was delighted to find someone crazy enough willing to take on this project with a four-week deadline! Fortunately, she had all the photos, memorabilia, newspaper articles, and notes organized by year in folders. I'll be sharing more about this project once it's done, as well as my thoughts on scrapbooking-for-hire. Here's a look at a few of the completed pages. 3. National Scrapbook Day - I am hosting a small crop here tomorrow to celebrate (inter)National Scrapbook Day. Mama and I are hoping to be joined by my friend Thayer for a day of scrapping, laughing, snacking, and visiting. 4. 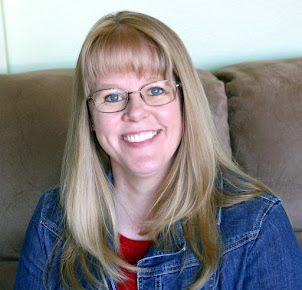 Photo Crush - I've signed up to participate in the Simple Scrapper Photo Crush free seven-day event. Although my digital photos are already organized, I'm always interested in tips and INSPIRATION for getting and staying organized as we continue to add digital photos to our files! 5. Focus Your Craft & Soul - I'm planning to participate in Jennifer Grace's next blog event May 15-17. 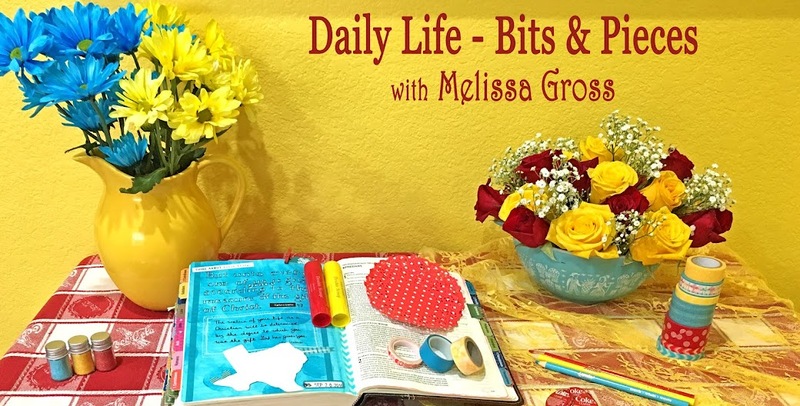 Here's how Jennifer Grace describes what's in store - This will cover a variety of ideas on how to focus your crafting, about living in the moment, making sure you appreciate the little things, and how to use focal points. We’ll also be using a lot of icons like targets, frames, arrows, triangles, and cameras! 6. Road Trip - We'll be taking a 2800 mile road trip in May . . . and I'll be checking an item off my 50 Things To Do Before I'm 50 list. As I've said before - there's so much INSPIRATION in travel - opportunities for photography, enjoying nature, learning new things, trying new foods, building relationships, linking up with blog friends (hopefully) . . . and, of course, lots of photos and memorabilia to scrap afterwards! 7. READING FOR INSPIRATION - I'll be continuing my participation in Part II of the Laura Ingalls Wilder course at Canvas.net. What kind of INSPIRATION did you enjoy in April? What are your plans for exploring and acting on INSPIRATION in May? as always you amaze me with how much you pack into a month. I did the first Laura Ingalls Wilder course, I forgot about it continuing! Wow sounds like a busy May! 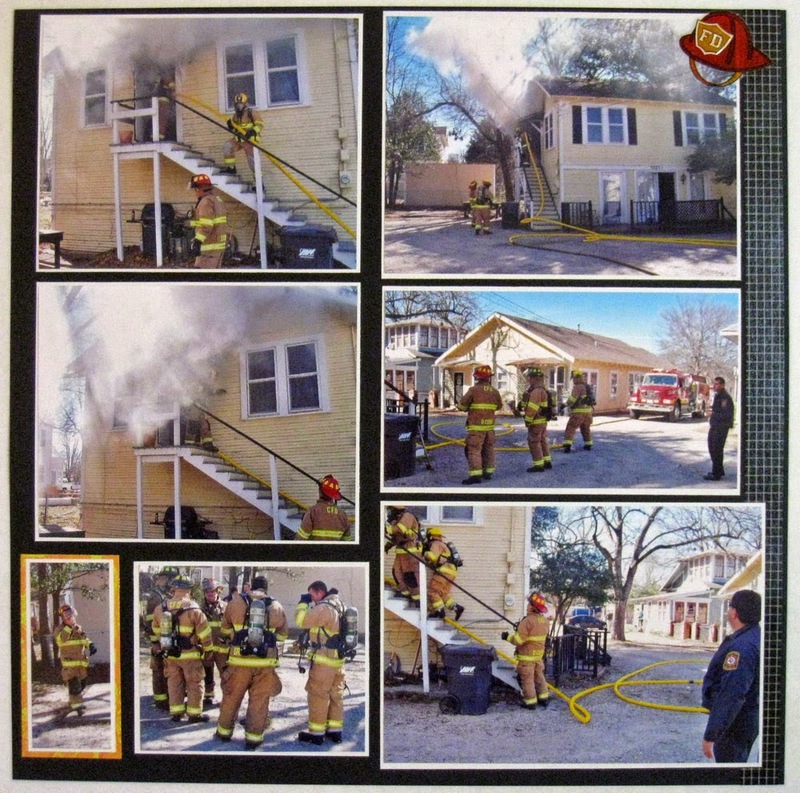 It's wonderful that you are doing the retirement album, the firefighter will cherish it. Have a great time on your road trip. Yeah, I made the list and those green arrows the top 5! I had lots of FUN too. The firefighters album is looking good. I missed the day to cancel my BPC membership so am in for another month too. It's alot of inspiration, now I need to apply it. You manage to accomplish SO MUCH every month! You're an inspiration! 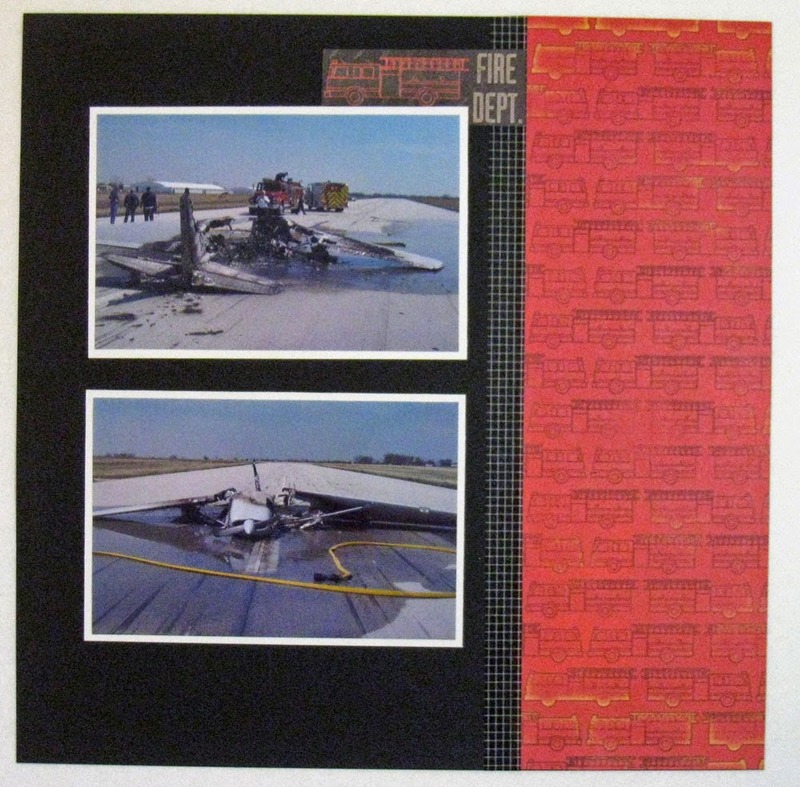 How wonderful that you've takne on the scrapbook for the firefighter. That's a big undertaking. Hoping to see you in May!